"Among Us Walks... A Goliath!" Doug: Today we'll begin an irregular series of comic book reviews featuring personal favorites of Karen and I. I'm leading off with a book that I'm sure those of you who have been around here for any length of time at all could have predicted would be on my very-short list of all-time favorites. Karen will be along in about a week or so with her first offering and then who knows? We've even discussed working in one of our partner reviews on a book that happens to be on both of our lists -- Silver Surfer #4! 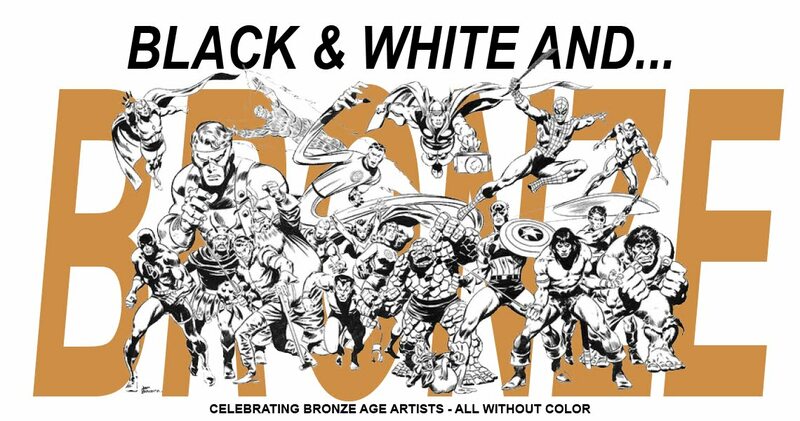 So buckle in -- I imagine this series will take us all over the Silver and Bronze Ages (and maybe even past?). Doug: As I said, I've written about this book on numerous occasions. 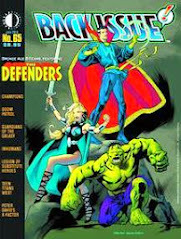 I still for the life of me cannot remember if I first came to it in its original form or in a Marvel Triple Action reprint -- it seems to me that I would almost have to have had the original somehow, as the MTA version was published after I think I first read this. At any rate, the cover alone stands as one of the best of the Kooky Quartet era. Attributed to Jack Kirby and Frank Giacoia (with lettering by Slammin' Sammy Rosen), it just exudes heroism and not just a bit "hey, don't mess with us". The interiors are of course by Don Heck, and I've gone on record several times saying I really do like Heck's art from this period. It's really familiar for me, as I had a couple of original 12c issues and the MTA's were reprinting in this period as well. Additionally, Giant-Size Avengers #5, reprinting Avengers King Size Special #1 was on the grocery shelf. So really, I grew up with Heck alongside the current pencillers, Bob Brown, Sal Buscema, and even Dave Cockrum. It was a great time to be a budding Avengers fan! Doug: Another thing that I found different but better from the comics then-presently on sale was the coloring of Captain America's uniform. The lighter blue with the little feather lines (my interpretation -- chain mail was a foreign concept to me) on the chest worked for me, and to be honest I always thought the navy blue seen in Cap's Bronze Age series looked off. Of course I warmed to the darker version, but I still have a soft spot for these old issues of the Avengers with that color scheme as a focal point. Lastly, before I get to the synopsis, Steve Rogers' true mark of heroism may not be that he defeated the Nazis and helped the Allies win the War -- it may be that he didn't kill Hawkeye! Man, ol' Hawk is tough to take in this time! 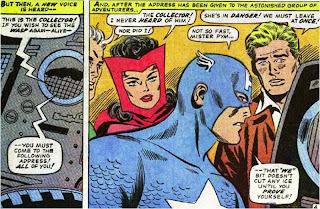 I'll periodically sit down and read a little run of the Avengers, and whenever I do the in-fighting and petty bickering is way over the top. But it is the hallmark of Stan Lee's Marvel Universe, and it's fully infiltrated his scripts on this book. OK, on to the story itself, and I'll continue a smattering here and there of why this single book is one of my all-time faves. Doug: We cut away to find Jan secured in a small vial, the prisoner of a creepy crusty-looking baddie named the Collector! This was his first appearance, and he's since gone down as one of the Avengers recurring foes (though never too deadly), with a major role in "The Korvac Saga". I've always wondered -- are his eyes just really deep set and dark, or does he wear a mask? Thoughts? He tells us right away what his schtick is -- he's amassed a collection of cool stuff from across time. His goal -- to collect a team of super-heroes! Hold on, because I know that sounds like a Silver Age DC, but it works here. 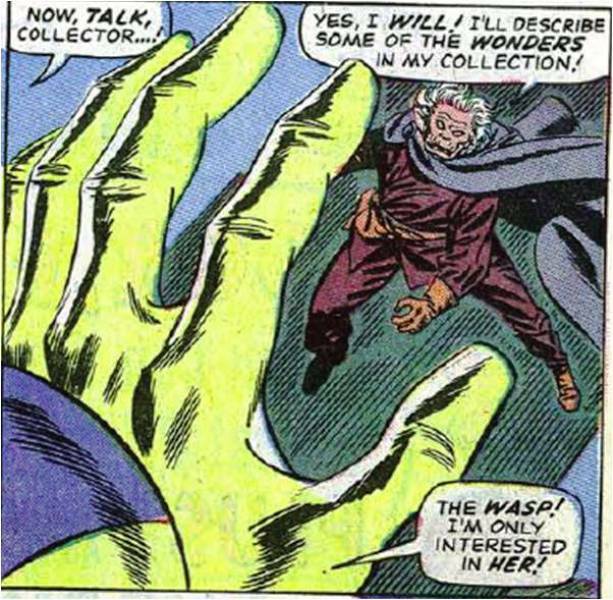 The Collector has already obtained a super-villain -- the Beetle! Wow! I wonder how hard that takedown was? I guess ol' prune-puss beat Scourge to the draw... We find out later that not only has the Beetle been collected, but he's under the influence of some obedience serum and can't make a break for it. Doug: Back to the Avengers, Hawkeye returns with Pym. He wants to get going right away, but the team insists that he prove himself. We learn that he and the Wasp resigned back in ish #16 due to Pym's fears that the constant size-changing was harming his body. But, he says, he'll give it a try so there are no doubts. 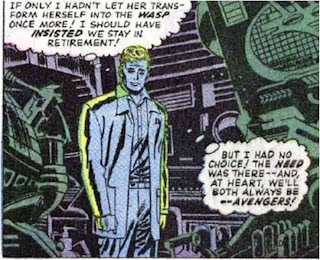 Suddenly Wanda, in typical Stan Lee girl-fashion, tells that she's sewn Pym a new costume, in the event he ever returned! Wow -- I wonder how she'll deck out the God of Thunder? But for my money, Wanda (does anyone know who really designed the Goliath costume? 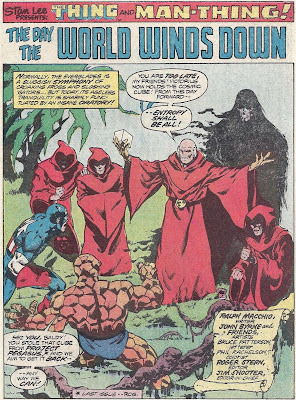 Was it Don Heck?) did a great job. I love the color scheme and it maintains some of the lines that exude growth -- dressed for success, I say! Pym has warned that the only height he can achieve is 25 feet; and he must stay there for 15 minutes (don't know why...). After a false start, he suddenly explodes upward in the alley. Hawkeye and Quicksilver become believers and the team quickly boards a quinjet. Doug: Prior to leaving, the Collector had somehow taken over the frequency at Avengers Mansion, told them that he had the Wasp and even where to find him! 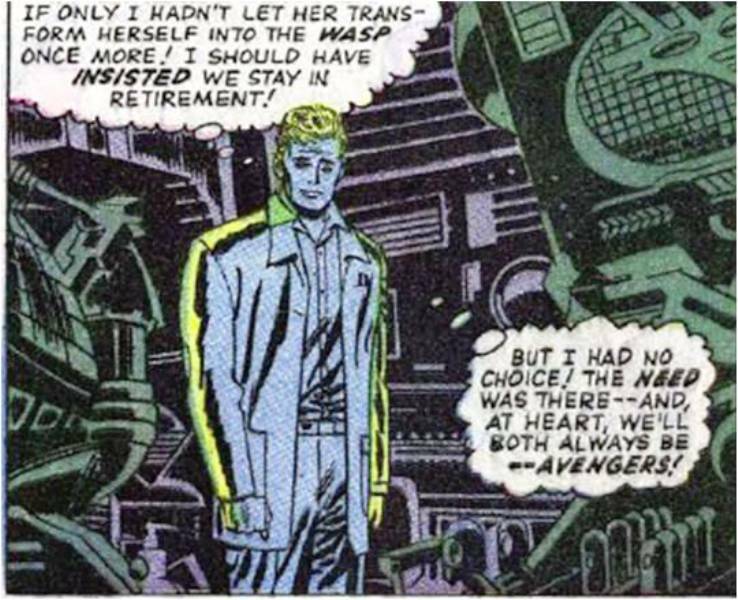 So as the quinjet streaks away, Hank Pym begins to take inventory of his new teammates. I think this aspect of the story was endearing to me, as my recollection was that I was also new to this team. Hank's opinions of Hawkeye and Cap seemed to mirror my own. Landing, Quicksilver of course speeds ahead and finds a castle. Awesome! What kid wouldn't like a story with a giant, a castle, and Captain America? The Collector allows our heroes to enter, and right into a trap. 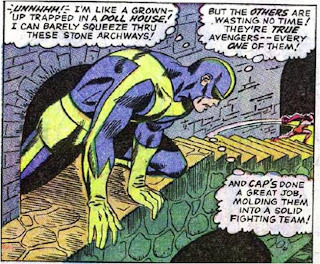 It's a pretty basic trap -- Cap sniffs it out immediately and of course the team is knocked out in a flash. We next see them all suspended from the ceiling by their wrists with the Collector gloating over them. 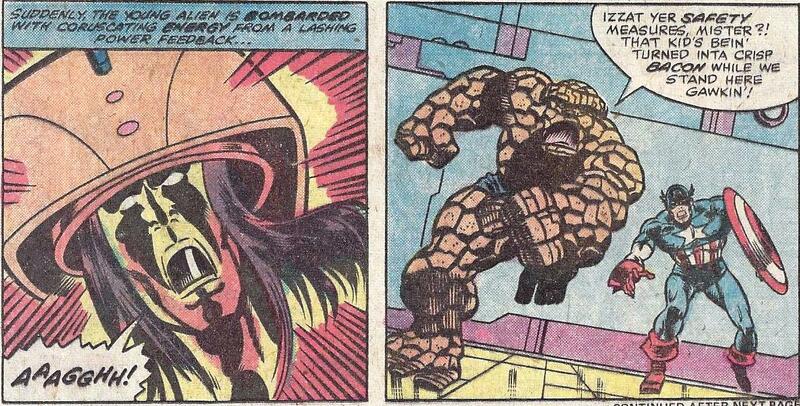 But as soon as the Wasp's name comes up, Pym loses it and shoots up and out of his bounds. Heck does a great job over the next several pages of really drawing Hank to scale. I'm not sure he always nails it at 25-feet, but back in the day I certainly got the idea. Doug: Hank, now called Goliath, and the team face several travails -- a catapult, the Beetle, a couple of giants grown from Jack's beanstalk, and a gong (that's right....). But in the end Earth's Mightiest Heroes win out. I think Stan and Don do a really nifty job of showing that this version of the Avengers can be taken down by lesser foes, and their strength is in their teamwork and in their unity. I will say, however, that "Maneuver Nine" forced me to suspend a little disbelief (but not the cape of levitation). Once the team is in control of the situation, the Collector plays his last card. If anyone steps forth, he'll crush the vial around his neck -- which contains the Wasp! Quicksilver solves that problem, though, and the Collector orders the Beetle to stand by his side as he grabs a funky-looking vase and does the big fade-out. Wanda launches a hex at the vial, releasing Jan (what a great power! Need something blown up? Falling from the ceiling? A vial the size of a pencil eraser opened? Wanda's your girl! ), who grows to full size. 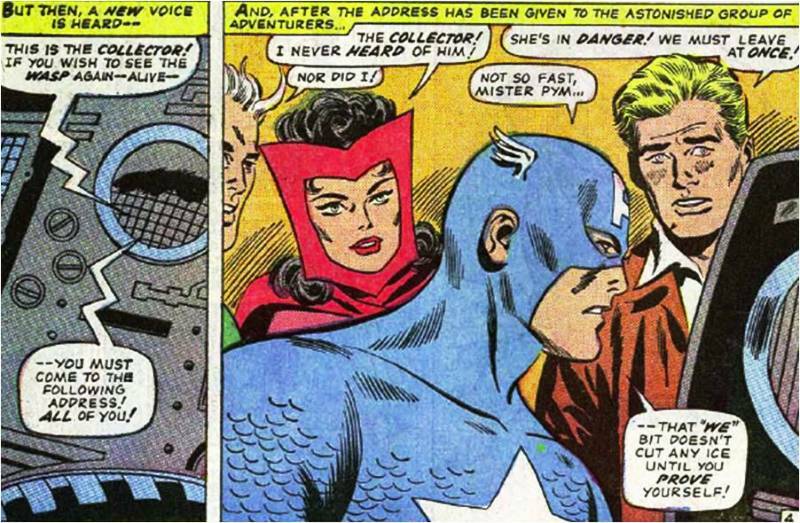 Right away Wanda notices that she isn't wearing a mask. Hank encourages her to reveal her ID, too. She does, and then tells Hank to shrink down and give her a smooch. But -- remember that 15-minute limit? Yep, exceeded that. Hank begins to get all woozy and passes out -- at 10-feet! Oh, the tension! Certainly, to be continued! Doug: If you've not read my Hank Pym essay, intended for publication in Assembled! 3, you should check it out. 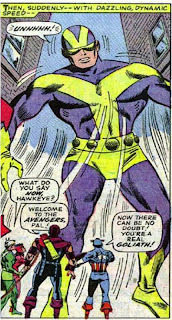 I detail my love affair with the Goliath character and on into Hank's switch to Yellowjacket. I won't go on with any of that here. But to close, I want to reiterate why I think this book is so cool -- teamwork, characters that aren't too powerful, an anything-goes villain, a damsel in distress, cool threads, and a cliffhanger ending that left a young boy wondering where he could find the next installment! This is honestly a story I never tire of... and that's the true mark of any favorite book. Karen: Have anything you'd like to say about ol' Buckethead? "The Day The World Winds Down"
Inkers: John Byrne "and friends"
Karen: The art in our second half is much more to my liking. By John Byrne 'and friends', it is a much more polished book. I'm not certain whose hands touched this issue, but I can see several different styles. 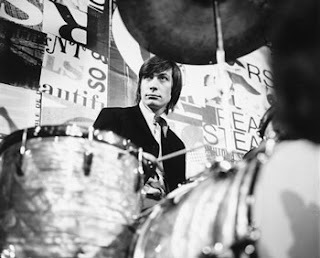 Byrne himself is evident, and perhaps also Dave Hunt. 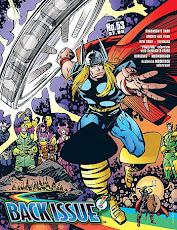 The official Marvel website also credits Walt Simonson. So part of the fun with this issue is trying to guess who inked what. Regardless, it looks really spectacular. Karen: Things pick up in the Everglades, where Victorius holds the Cosmic Cube and proclaims that he shall use it to bring about all-encompassing entropy. 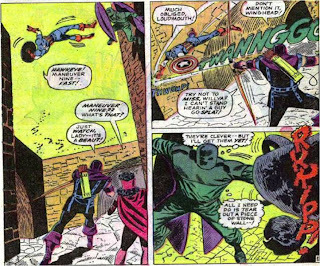 Ben starts to go after him but Cap stops him, predicting the villain is about to explain his plan, and Victorius happily obliges. He explains that he survived his battle with Ka-Zar (see last week's review) but felt directionless. That's when he discovered the Cult of Entropy (by picking up a book in an occult bookstore!). Feeling that the universe was always heading towards decline and decay, the philosophy struck a chord with him. He sought them out and became their new leader. When he heard that Pegasus had the Cube, he knew he had to get it in order to fulfill his new scheme. 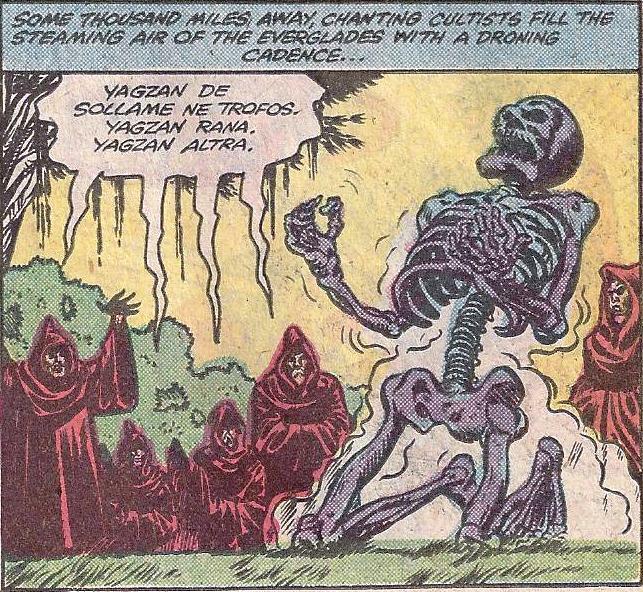 He used it to re-create the cult's former leader, Yagzan, from his skeletal remains and the Earth itself. This new creature became the personification of Entropy -Jude, the Entropic Man. What kind of a name is Jude for the embodiment of entropy? Personally it makes me think of the Beatles' song! Anyway, the cult happened upon two lover s in the swamp (?) and Jude "initiated" them -turning them to the dust they'd once been. Outraged about how casually Victorius describes the murder, Ben flings himself at the man, but is knocked back by a burst of energy from the Cube. Karen: The blast leaves Ben unconscious, but Cap is raring to go! He goads Victorius into fighting him one on one. Seeing it as a great opportunity, to test himself against the original super soldier, Victorius agrees. 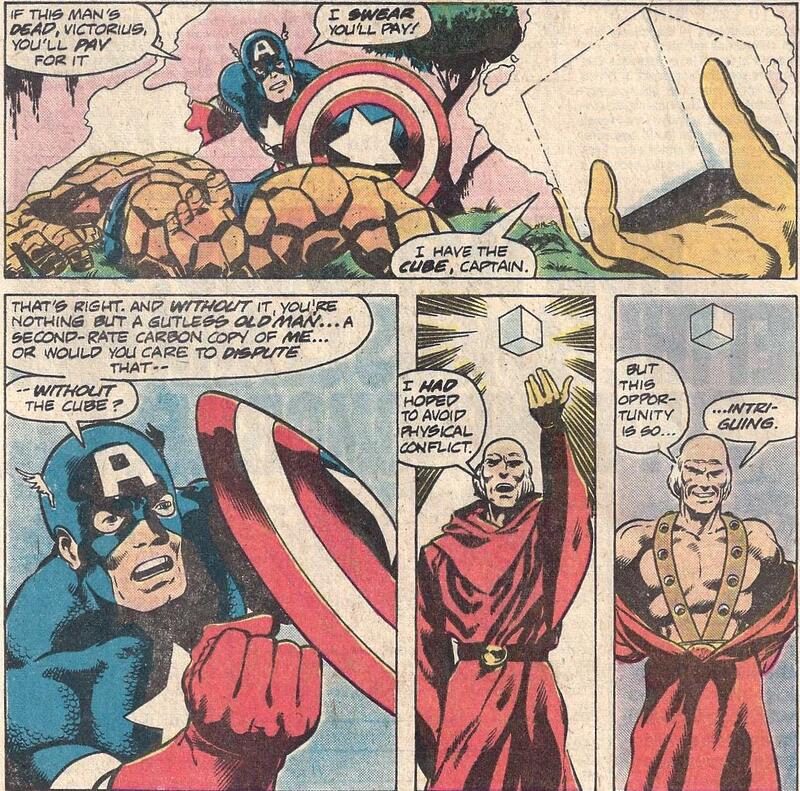 He leaves the Cube floating in mid-air as he and the Captain go at it mano a mano. The two are well matched, although I would assume Cap really has the upper hand in the skill deppartment. The two super soldiers and the cultists do not notice as the Man-Thing makes his way from the swamp. Ironically, we have another would-be super-soldier here, as the Man-Thing was once scientist Ted Sallis, another man who had tried to reproduce the Super-Soldier formula, but with disastrous results. Just an aside, I think it's a cool idea that in the Marvel films, Bruce Banner became the Hulk because he too was trying to make a Super-Soldier serum. Of course, that's taken from the Ultimate universe, but even so, it ties things together nicely. 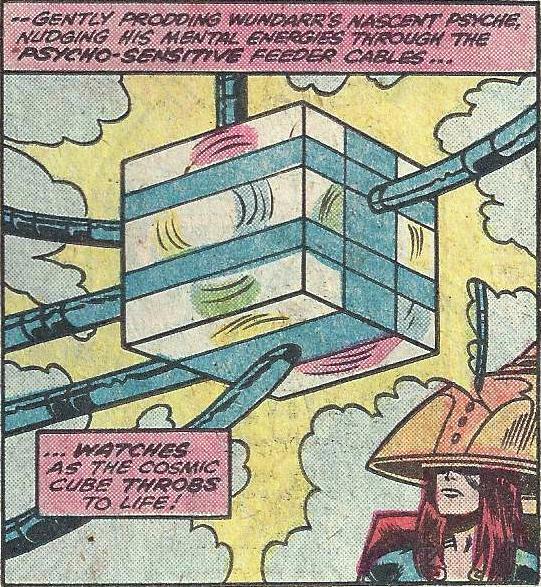 Karen: As Cap and Victorius fight and debate their philosophical positions, the muck monster is drawn to the Cube. It reaches out and grabs it. 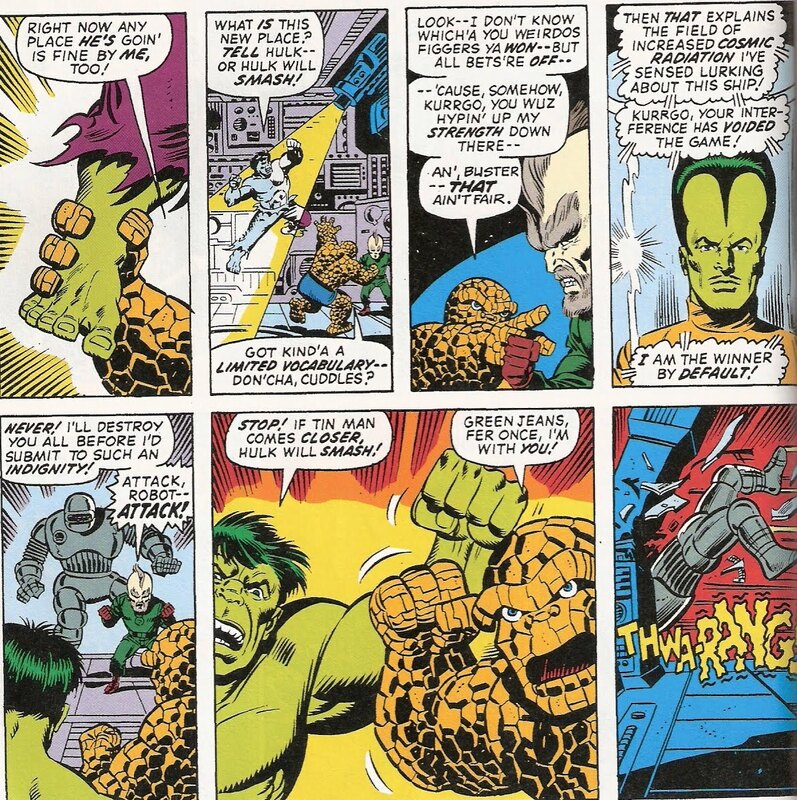 Just at this moment, Ben groggily rises, and can't believe what he sees before him: Cap and Victorius slugging it out, the Entropic Man calmly watching, and in the middle of it all, the Man-Thing groping at the Cube. 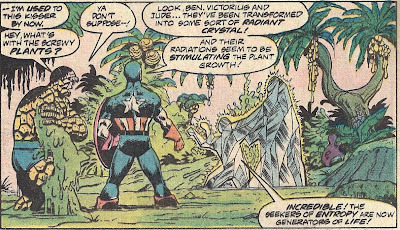 The Entropic Man decides that Victorius' battle is a waste of time, and he begins to "indoctrinate" Cap, basically mind -controlling him. 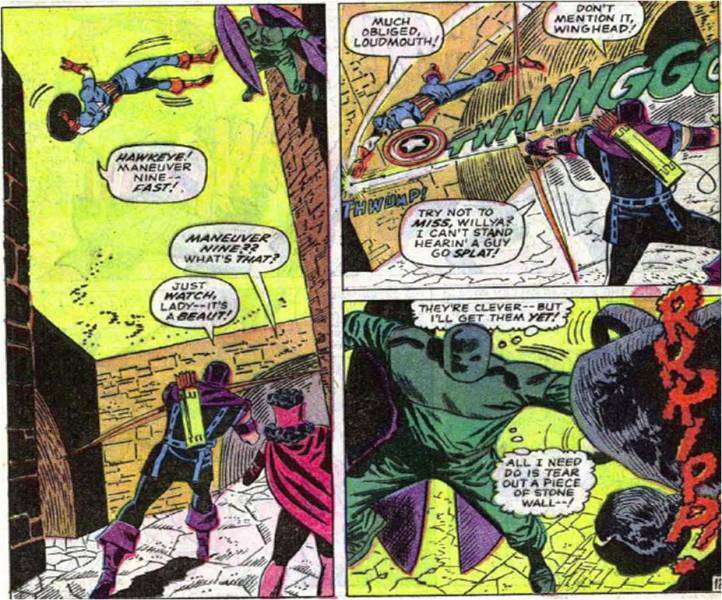 Just as he's about to pull him into his cloak of non-existence, Ben leaps and grabs Cap and throws him aside. However, the Entropic Man grabs Ben instead and pulls him in. 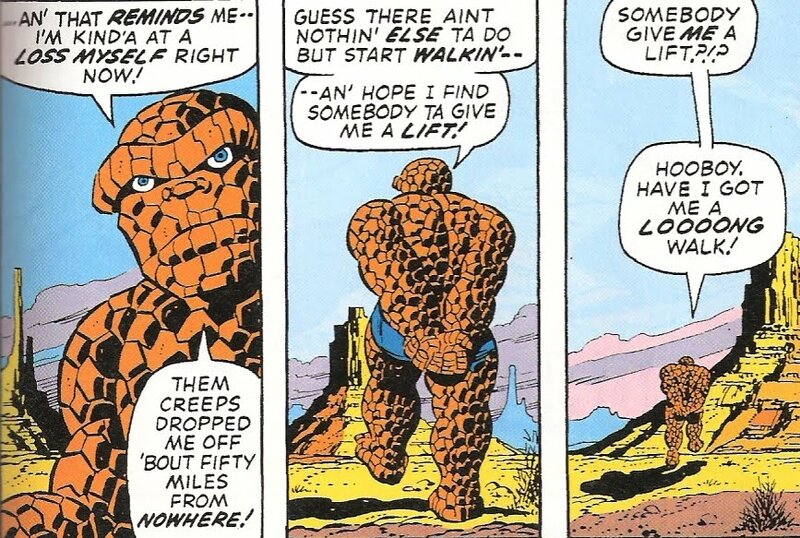 You'd think this would kill him -but instead, it turns him back into plain, human Ben Grimm! Karen: Ben is a bit shocked but he knows he has no time to waste. He tries to stall the Entropic Man, arguing with him over his idea of entropy being peace. The creature begins to have doubt about whether his way is the best one. "I did but desire your happiness," he says, somewhat hurt. Victorius realizes that Ben is beginning to sway him, and punches Grimm in the back of the head. Cap has recovered though and intercedes. Victorius figures his only chance is to use the Cube and erase any doubt from his ally. 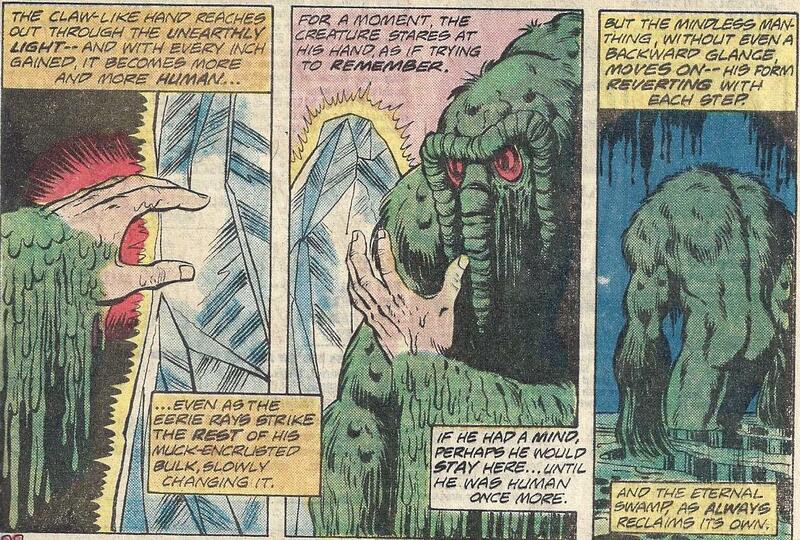 But the Man-Thing is still holding onto it. The AIM Super-Soldier angrily yells at the monster and seems on the edge of panic. This draws the Entropic Man's attention. He tells Victorius that it is not his time, that life yet prevails on Earth. But he is more than willing to share entropy with Victorius! 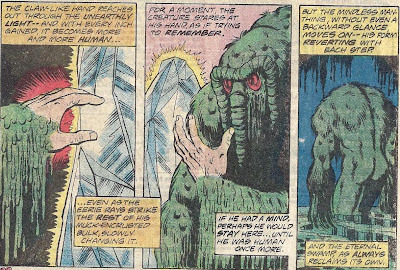 The man becomes terrified, filled with fear - and as we all know, whatever knows fear burns at the Man-Thing's touch! The combination of entropy, Cosmic Cube, and that burning touch causes a massive explosion. Cap picks himself up from the goo and finds that Ben has turned back into the Thing again. He doesn't seem concerned about it. At this stage Ben has accepted his fate. They discover that Victorius and the Entropic Man have merged into a strange crystal-like substance. All around them, the swamp has flowered and burst with new life. Ironically, the cult of entropy has become a source of life. Cap scoops up the Cube, which appears to be dormant again. "All ya got there is a cosmic paperweight," Ben says. Karen: The two men head off together, but behind them, the Man-Thing re-forms from the swamp. He wanders over to the crystal and touches it -and his hand becomes human. The creature pauses and looks at its new hand, as if almost remembering that it was once human. But then it wanders away into the everglades, reverting to its monstrous state. Karen: This was really a fun story to re-read. I've always found the Thing and Captain America to make a great team. Maybe it's that shared respect of veterans (recall, originally Ben and Reed were WWII veterans!) but whatever it is, they work well together. The Man-Thing was slipped into the story and one could say he was unnecessary but I thought it was a nice touch, and didn't detract from anything. Heck, it's one of the things I love about the Marvel Universe -these crazy characters were always running into each other! Everything in this issue was really top notch. All in all, a nice two-parter. Karen: This was a show that really creeped me out as a kid. In fact, even today I get a little freaked out by it. The scary paintings, weird music, and genuinely frightening stories were almost too much to take. What do you think? Doug: Pretty simple question today, kids: name your favorite drummer, or perhaps your favorite song featuring some awesome backbeating. 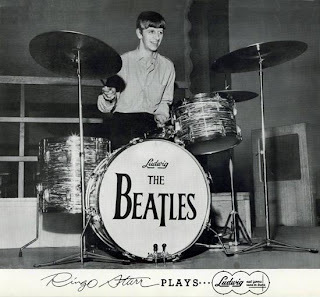 Do you go for that confident, enhancing sound -- professional, creating a foot-tapping in all of us, akin to Ringo Starr or Charlie Watts? 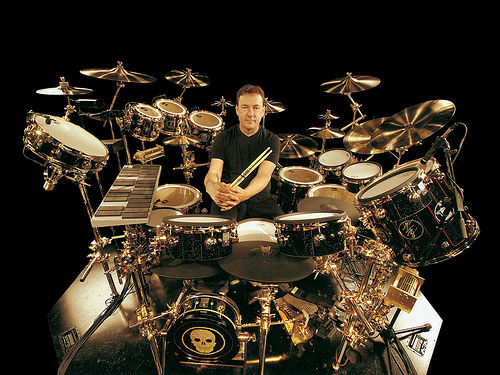 Or do you prefer a bit more of a virtuoso (drawing attention to the percussion in its own right), such as Neil Peart of Rush? Hey, maybe "your guy" (or gal) isn't in the public eye so much -- maybe you're partial to a song or songs that feature a studio musician. At any rate, today let's talk about our favorite beats. 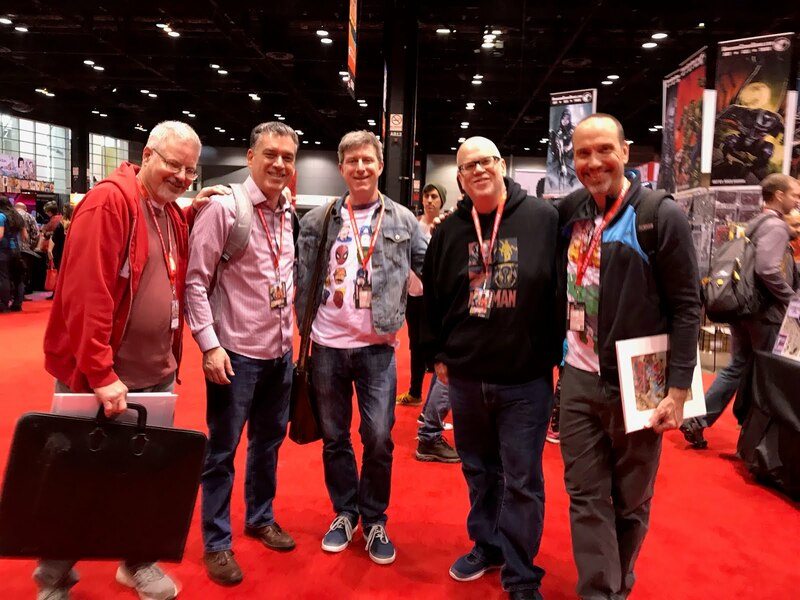 Doug: So what are two Bronze Age bloggers to do, with an Avengers 3-parter finished up yet a week before Giant-Size July? 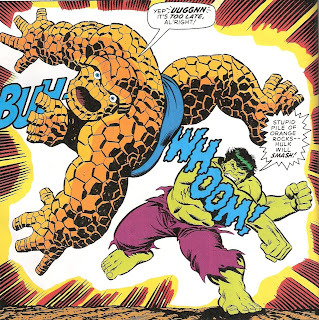 Shoot -- run a review of a Thing/Hulk throwdown, that's what we'll do! Doug: I'll start today's thoughts in the art department. 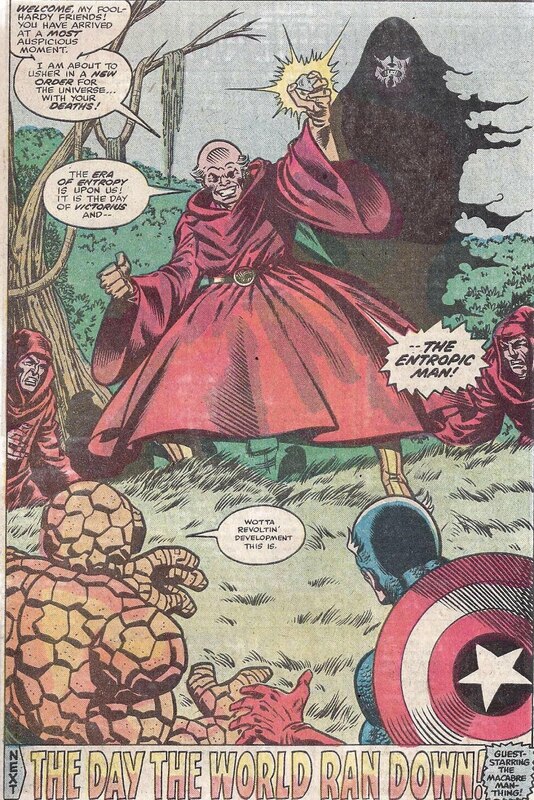 A) I think Jim Starlin is a great storyteller. I'm not an aficionado of his work like my partner, but more of an admirer from afar. That being said, Starlin's art, particularly early in his career, was not always what I'd set forth as his best art. 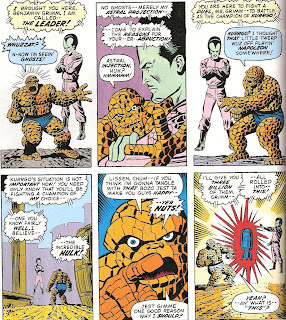 However, B) Joe Sinnott can make anyone look great! And that being said, there's no doubt that in this here tale, Jim's under the influence of Joe. 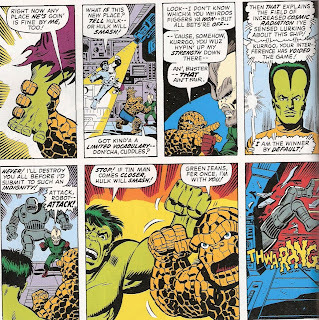 This is a very polished set of graphics that could have slid right into the FF's own mag and we'd have hardly noticed any difference between that book's other Bronze Age pencillers -- Romita, J. Buscema, and Buckler. Nope -- Sinnott has 'em all covered... literally. Don't get me wrong -- I love Joe! But he does show through, doesn't he? Karen: I think the art team worked out pretty well. Yes, Sinnott is a dominating inker. But I have to be honest and say that as much as I love Starlin's work, I've never felt like he drew a great Thing or Hulk. But they look pretty darn good here. 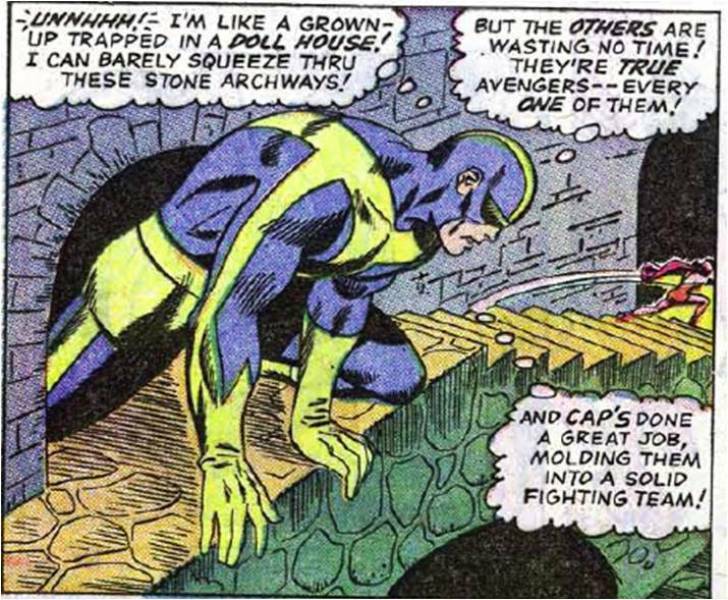 Doug: Len Wein's no dummy -- by 1973, certain formulas had been working quite well in the Baxter Building over the past 12 years. We begin with a boisterous Benjamin J. Grimm, wrecking some more multi-million dollar machinery. Reed and Johnny are there, both on Ben to knock it off. 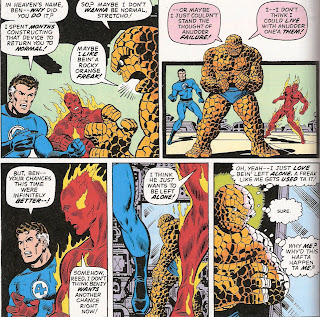 Reed tells that Ben's destroying another opportunity at being cured of being the Thing. 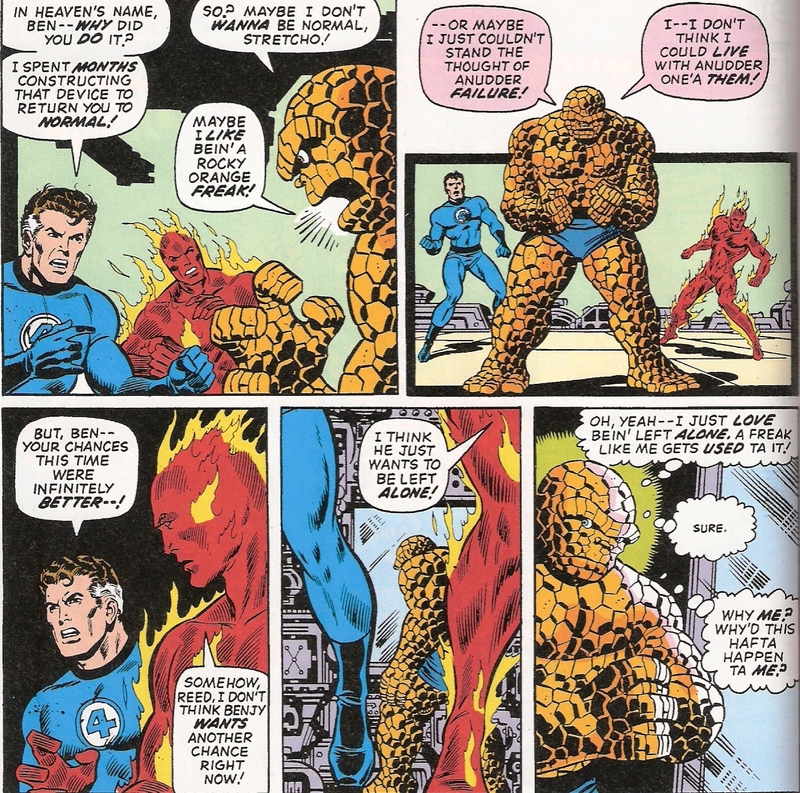 But Ben tells Reed to back off -- Ben just doesn't think he can take the disappointment of another failed attempt at saving him from his inhuman existence. Johnny convinces Reed to give Ben some space, and they leave him alone. Ben begins to sulk, and reflect on his origins. But what he doesn't know is that his thoughts are being monitored from a spaceship, by Kurrgo, the Master of Planet X (last seen in FF #7, 1962, kiddies)! Which brings me to this question -- how do you, Karen (and all of our readers) feel about very obscure villains suddenly seeing the light of day once more? Karen: This time period was sort of the last hurrah for Ben's angst over his rocky form. From the late 70s and on, I don't think we really heard much about him wanting to return to his human form. By then, perhaps because the writers felt it was played out, he seemed to have adjusted and accepted his fate. 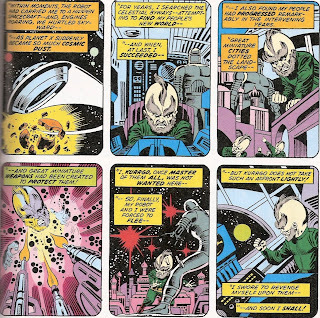 Doug: Kurrgo is nice enough to recap his own origin for us -- of how he was defeated by the FF, how Reed shrunk his people to save them from a collision with another planet, and how evil Kurrgo hoarded the enlarging gas for himself. Rather than becoming his people's master, however, Kurrgo found himself seconds from death. 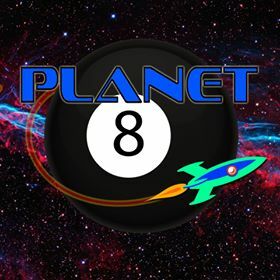 His robot slave saved him, taking him to a ship and blasting away just as Planet X exploded! Kurrgo searched all of space for his people, finally finding them; they, however, were not so pleased to see him. Kurrgo was a giant to them, but their science had advanced to the point that they could drive him away. Fleeing, the megalomaniac swore his revenge. Kurrgo came back to Earth to enlist the aid of her strongest being -- the Thing! 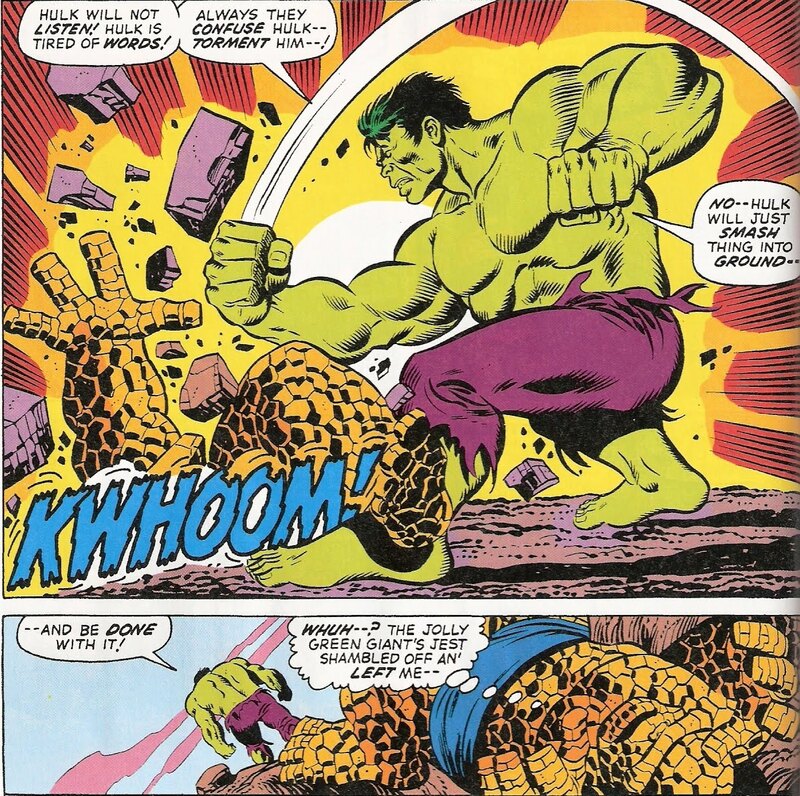 But when he found that the Hulk was now the strongest he attempted to enslave him. Yet, another intervened -- the Leader! Karen: I'm probably showing my ignorance of the Leader here, but I'm not sure exactly how he interfered with Kurrgo's plans; he's paralyzed after all. Sure, he can make an astral projection of himself, ala Dr. Strange or Professor X, but how did he ever mess up Kurrgo's plans? 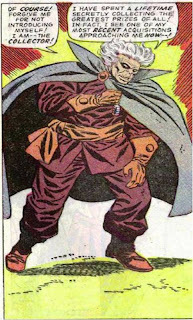 Doug: What Wein has constructed for us is not unlike other stories where super-baddies choose champions to battle in their stead -- such as the Grandmaster's games with other conquerors. Here we find the paralyzed Leader, hopeful that the Hulk holds the key to his rehabilitation. Kurrgo has his own motives for enlisting either giant. But these two have instead struck a bargain -- the Leader will use the Hulk, while Kurrgo employs the Thing in a battle for supremacy. 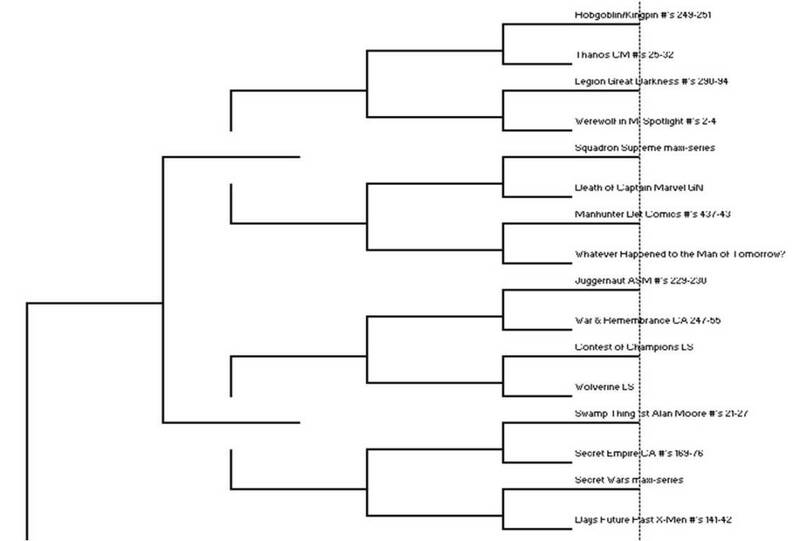 The winner will gain the services of both monsters, as well as all of the scientific knowledge of the defeated. So the Leader transports the still angry Thing from the Baxter Building to a ghost town in the American Southwest -- could be right around the corner from Karen! Karen: If you had to have a fight between these two powerhouses, the vast open expanse of the desert would be a good place for it. The whole fight seems contrived, but then again, maybe for big brains like them this is a great way to spend an afternoon. 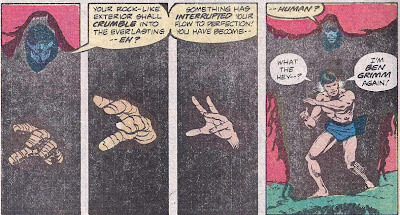 Doug: The Leader sends an astral projection (or "injection" to the Thing's mind) to tell Grimm what's up. Ben of course wants no part of tangling with the Hulk, but the Leader convinces him with the alleged placement of an "Ultrex Bomb" capable of destroying Earth and set to explode in less than 30 minutes! I thought it was amusing that the Leader states to Ben that three billion lives are at stake -- shoot, we're more than double that size now (and comics aren't half as good! You'd think with that many more creative minds we could get a decent yarn produced these days!!). Karen: Ben isn't sure he believes the Leader, but he can't take the chance he's telling the truth. Doug: So if you were looking for some pure, unadulterated comic book action, you came to the right book. The Leader brings the Hulk to the scene, and an 8-page smash-'em-up commences. We find out that Kurrgo is secretly augmenting the Thing's strength and it makes this a bit more interesting that it normally would be. Starlin and Sinnott do a great job of depicting the Thing as more of an equal to the Hulk in strength and stamina, but not in size. 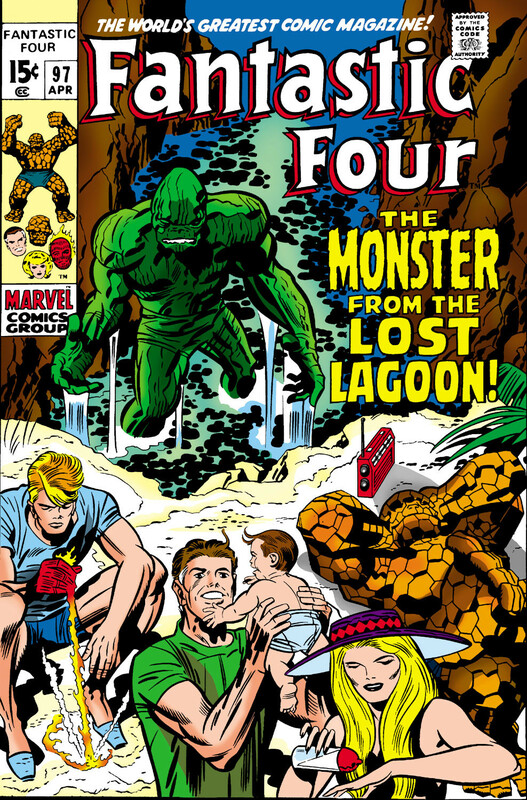 But it's a subtle difference -- not the glaring disadvantage Ben had when Jack Kirby drew the cover of Fantastic Four #25. It's funny -- that Thing/Hulk battle also began with Reed concocting some formula to help Ben. See, told you Len Wein had done his homework! Karen: It's a fun fight -Hulk here really has no idea what's going on, and he doesn't seem to care much. He just wants to hit someone! I liked how Ben realized that something was wrong -he shouldn't be that strong. 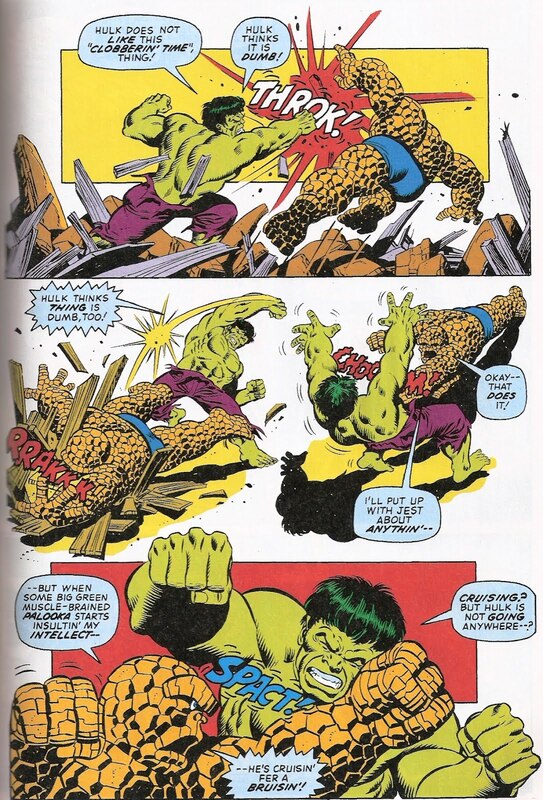 Doug: Ben finally finds a gap in the fisticuffs to tell the Hulk about the bomb. But as you might suspect, Greenskin isn't interested in talking. He pounds Ben into the ground, and then turns to leave. But Ben knows time is running out, so takes off after the Hulk, who is headed to the side of town where the Leader had planted the bomb. 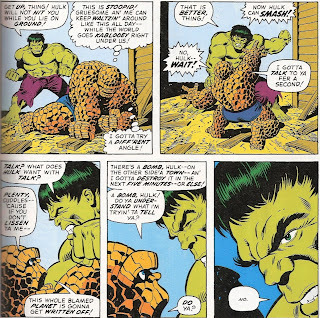 Ben knocks Hulk clean into a building, and finds the bomb. Now I don't know how much you know about defusing a bomb, but I'm of the opinion that throwing a hard rocky fist at it probably isn't the best strategy. It's a fake, after all, but right as Ben's about to get walloped by an even madder Hulk, the two behemoths are in a tractor beam and drawn up into Kurrgo's ship. Kurrgo's cheating is quickly exposed, but he attempts to win after all by siccing his robot on our heroes. No dice. Ben and Hulk hit the bucket of bolts so hard that he goes into a wall of control panels and sets the ship all a'tizzy. 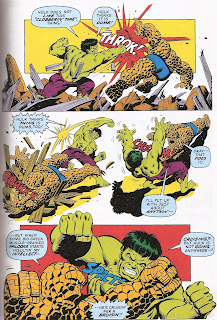 As Ben and Hulk leap away, the ship explodes and crashes. More Area-51 fodder? 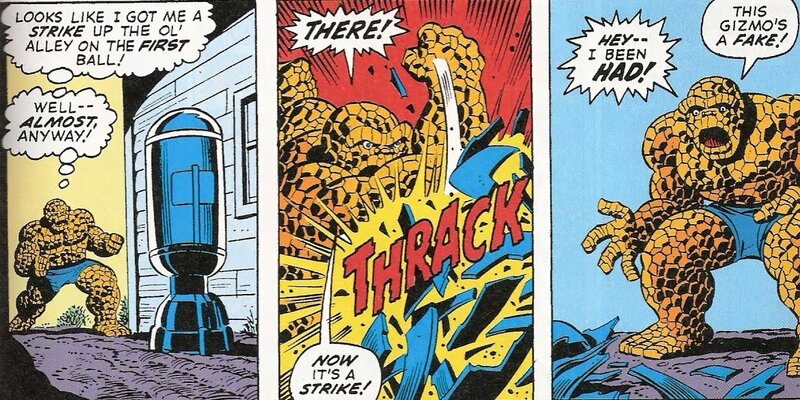 Karen: Smashing a bomb would not be my first choice for how to disarm it, but then again, it's the Marvel Universe. I thought it was very true to character that Ben pointed out that Kurrgo had been cheating by amplifying his strength. 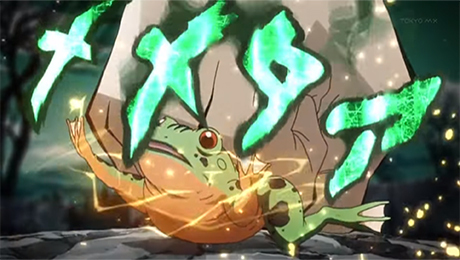 However, even with his strength increased, he really didn't have the upper hand -it was more of a tie. Sadly, Ben's leg muscle won't allow him to go leaping off (why is that anyway?) like Hulk does. Doug: As Ben heads back to civilization, he's still moaning about his looks from his "born loser" point-of-view. I thought Wein really wrote the characters well here. If you'd hid the credits from me, I probably couldn't have told you that Roy Thomas wasn't the author -- this is all pretty seamless alongside the FF's of the day. And as I said at the top, the art was thoroughly enjoyable, yet quite a contrast from Starlin's work on Iron Man #55 which we reviewed a couple of weeks ago. We'd remind you that Starlin was working with Mike Esposito on that one, but in just six months and one inker, the improvement is astonishing. Hey, another 20-minutes well-spent in the Bronze Age! Karen: Agreed on all counts. I think a lot of the writers that came along in the 70s really understood the characters and knew how to write them - plus a big part of it was keeping Stan's style (as far as speech patterns), and of course, Ben's speech patterns are pretty unique. A nice, light read all the way around. 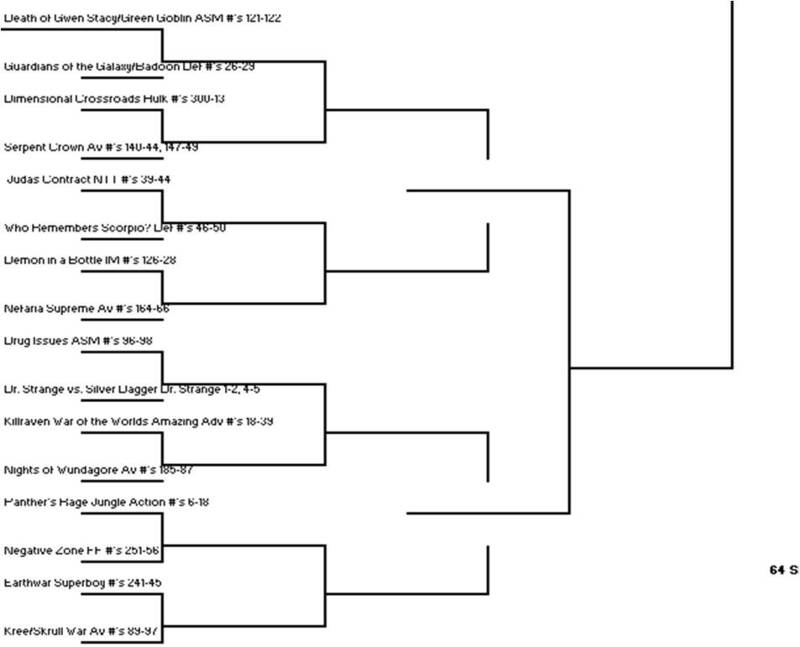 Doug: The brackets are posted below, and the first round of voting is located over on the left side of this page. 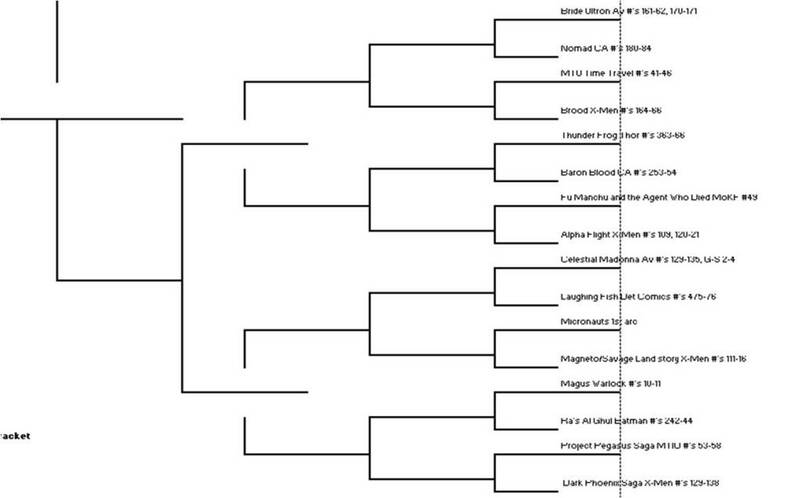 Beginning today (well, last night actually) and running through Wednesday evening, you can vote in 16 Bronze Age match-ups. 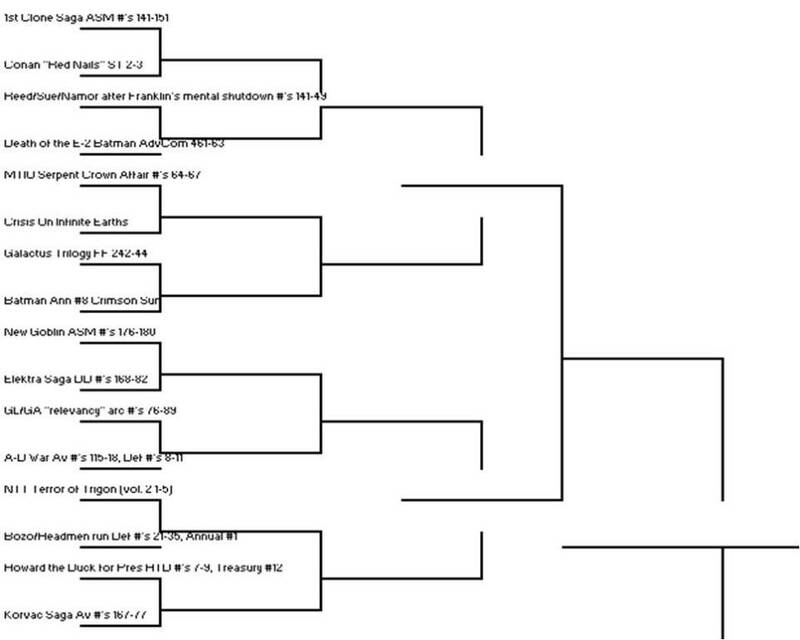 We'll be back in a week with 16 more, on the other half of the bracket, which will conclude Round One. 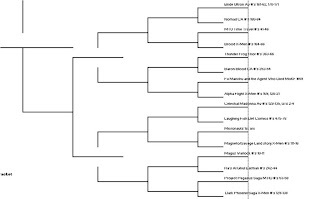 Doug: For the purposes of this exercise, there was no seeding -- stories were entered onto the bracket in a somewhat randomly alphabetically sequential order, if that makes any sense. Consequently, you may find some curious battles -- at times you'll cry "no contest! "; at others you'll be disappointed because you'll find two marquee tales facing off in the early rounds. That's the way the cookie crumbles, as they say. 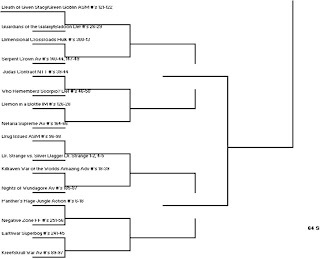 The entire bracket is below (I have no way to attach an Excel spreadsheet -- I saved the image as a .jpg and tried to make it large enough to read once you make the jump); as I said above our first go at it is just on the left side of the 64-team bracket; we'll tackle the right side next weekend. 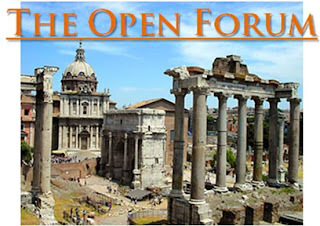 Doug: In addition to moderator-bashing, today's comments section could be filled with "the ones that got away". 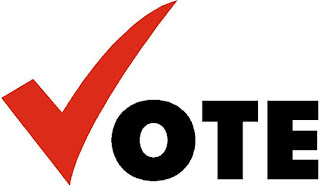 Last week several of you said there were stories and storylines you wished you'd nominated. Well, now would be a good time to name all of our oversights! And as always, thanks for your participation! Doug: Whatever you want to talk about today -- the floor is open! We've done this many times in the past, usually allowing the first commenter to set the topic for the day. However, as we've gone on these past many months, we know many of you have things to say. So today, no worries about thread-jacking, etc. Let the conversations just open and flow organically. Karen: What do you think of Luke Cage, aka Hero for Hire, aka Power Man? Born of the blaxploitation era of cinema, partner of Iron Fist, and now an Avenger. The first African American super-hero to have his own mag -that's something. He's changed a lot over the years. Let's hear your thoughts on him. And please, try to use the phrase "Sweet Christmas!" only once. Karen: This post kicks off a two part review of a story in Marvel Two-In-One that deals with the both the super soldier serum and the Cosmic Cube. 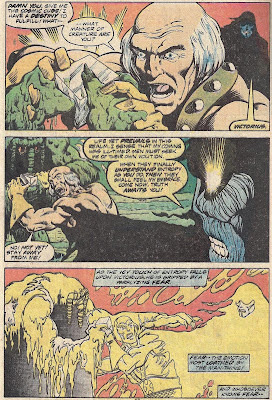 Originally I had intended this to be a longer series of posts, as the story actually started in Astonishing Tales, featuring Ka-Zar, back in 1973. But after having read those issues, I decided to spare you the pain and just go with the condensed version. Honestly, those Ka-Zar stories are pretty dreadful. All you really need to know from them is that both AIM and SHIELD were working hard to rediscover the super-soldier formula of Dr. Erskine -the formula that turned Steve Rogers into Captain America. A scientist, Victor Conrad, at AIM got ahold of the original formula and used it on himself. He went on to fight Ka-Zar and lost, and presumably died in a great fall into a moat. Got it? Karen: Present-time: Bashful Benjy tears thr ough a six-inch thick titanium steel door at the new Project Pegasus research center. He's surrounded by men knocks them around like children. Leaping from the other side of the room is none other than Captain America. He orders the men back and lands just in time to block a huge orange fist with his shield. Ben is raging, beyond reason. 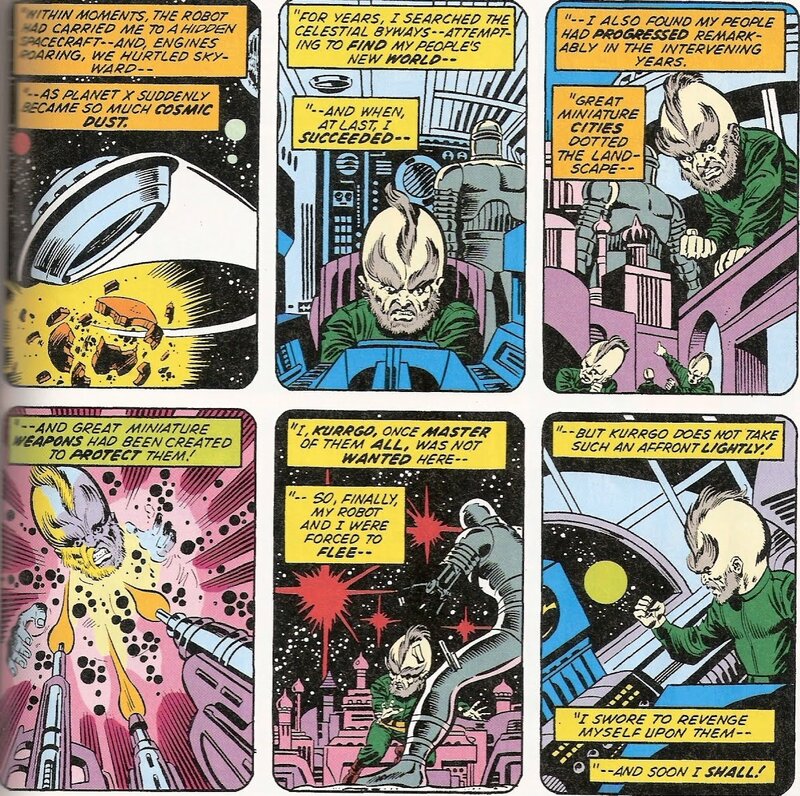 it turns out he's upset about Wundarr, the alien super-teen with the mind of a child who was once Ben's ward. Project Pegasus has taken him and Ben wants to know why. Cap tries to calm him but it does no good. Finally, the Captain triggers a device that puts Ben into a force field. Unable to do much more than float, Ben finally settles down. Karen: Cap gives Ben a quick tour of the facility run by "the new Department of Energy" (started by Jimmy Carter, remember?) but all Ben cares about is Wundarr. The two men take an elevator down to a lower level, in the cosmic radiation section where Wundarr is being held. The scientists want to use Wundarr's abilities to see if he can stimulate the Cosmic Cube back into functioning. Just like in the Avengers film, the technos theorize that the cube could be a tremendous energy source. It's interesting to note here that when Ben complains about Wundarr being held captive, Cap says that Wundarr is an illegal alien after all! Where's that Englehart Cap when you need him? But he also assures Ben that the scientists are trying to help improve his intelligence, which has been badly stunted. Wundarr is brought out in a fancy shackle, which he promptly bursts, and goes running off. Ben jumps in to intercede and protect him. The youth sees him and cries out "Unca Benjy!" and runs to the one person he trusts. Ben wraps him in a protective bear hug. Karen: Ben tells Wundarr that he's going to be OK, he won't let anything happen to him. But he feels badly about taking him back to the lab. Wundarr is strapped into a chair with a big colander over his head and the dormant Cube hangs before him. The helmet gizmo apparently activates Wundarr's power, and the Cube begins to pulsate with power once again. Wundarr begins to get panicky, and Ben, watching from another room, is in agony. Suddenly, one of the scientists throws a switch and Wundarr is bombarded with energy. He screams in pain, and that's enough for Ben. He once again tears a wall down to get to his young friend. Cap immediately suspects sabotage and spots a figure on a catwalk. He jumps up and the scientist there says "Blast! I- of all people -should have known you could reach me up here !" This perplexes Cap enough that he's caught off guard, and the mysterious saboteur backhands him hard, sending him flying. The man jumps down into the cell with Wundarr and grabs the Cube and teleports away. Karen: Our scene switches to a swamp and a group of red-robed cultists chanting in an unearthly tongue. They seem to be praying around a human skeleton. Suddenly, the man with the Cube appears before them. He tears off a mask (here we go with the masks again! 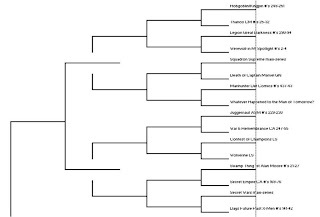 A running theme for comments here at BAB) and reveals himself as Victor Conrad, aka Victorius, the AIM scientist who took the Super Soldier serum. It appears he's become the leader of these 'Entropists'. Karen: Back at Project Pegasus, things are not looking good for Wundarr. The energy he absorbed from the Cube has rendered him comatose. 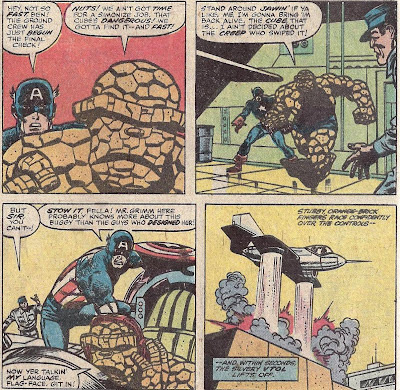 Ben is crushed and Cap does a sort of poor job consoling him, almost as if he's preparing Ben to lose Wundarr. Since he can't help Wundarr, Ben wants to go after the man who hurt him and took the Cube. Cap points the way to a jet equipped with devices from Stark Industries designed to detect energy signatures. Ben jumps in the cockpit despite the protests of the technicians, and he and Cap are off. Karen: They trace the Cube to the Florida everglades. Landing the VTOL craft in the swamp, Ben questions whether the equipment is working properly. Who would take an object as powerful as the Cube and go here? Moments later, they get their answer, as they are faced by Victorius and his followers, included a cloaked dark being called the Entropic Man. Victorius declares that he is going to usher in a new order for the universe. Just like everyone else who has ever had the Cube! But as Ben says, "Wotta revoltin' development." Karen: I enjoyed this story, although it really is mostly set-up for part two. The art is all right, although I think another inker on Sal might have worked better. It sometimes looks rushed. This was our introduction to Project Pegasus, which would have its own saga in MTIO #53-58 . I have to say I think George Perez did a great job in getting the size and scope of the lab across in those issues. But I thought it was interesting how some of the ideas from the Avengers film appear to have originated here. I had not remembered that the Cube had been taken to Project Pegasus after Thanos' defeat. The base at the beginning of the film is shown to be Project Pegasus on a sign briefly seen. I also did not recall the idea that the Cube could be an energy source- I thought that originated in the Captain America and Avengers films alone, but obviously that is not the case. Now if they'd only call the thing the Cosmic Cube, I'd really be happy! 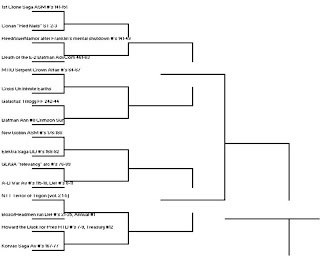 Another Round of Bracketology, Anyone? Hey Kids, it's Ice Cream! !